East-facing rendering of new Student Housing and Dining. Fill out our survey on the proposed designs below. UVic is planning for new student housing that will provide much needed on-campus housing for approximately 600 students currently living off-campus. Living on campus assists students with their transition to university, provides academic and social programming and support, and nurtures a strong sense of belonging in the UVic community. 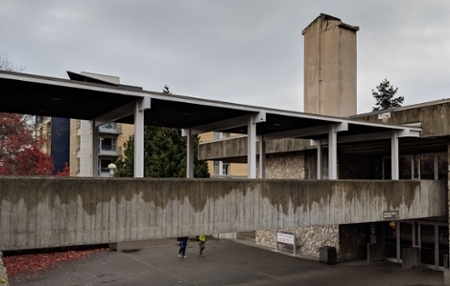 UVic’s Campus Plan guides the physical growth and change on the campus and its outlying lands. The new student housing project is the first significant capital project since the Campus Plan was renewed in 2016. This important project will build on the ideas generated through the Campus Plan and will help achieve our vision as not only an extraordinary academic environment, but also a vibrant and sustainable community that nurtures student experience and well-being. Community Engagement is an essential component of planning for new student housing. We want to hear from students, staff, community members and other stakeholders to help shape plans for the project. Open Houses and community meetings took place in November 2018 to share proposed building and landscape designs. A summary of the input from the community can be found here. A Development Variance Permit Application was submitted to the District of Saanich on December 14, 2018. The District of Saanich Zoning Bylaw requires that a Development Variance Permit be obtained for campus building projects that exceed 10 metres in height. The University has requested to vary the permitted height of buildings from 10m to 30m and 38m respectively. In designing each of the buildings, the University has consulted with the community on the development of site planning and design principles that would allow for the development of taller buildings successfully on campus. As the project proposes no new parking spaces, the University has also requested to vary the required number of vehicle parking spaces. The Project will provide 621 existing students who currently live in the community the opportunity to live on campus. This will result in 621 fewer daily trips to-and-from the campus. The Zoning Bylaw requirement for vehicle parking is 450 spaces. However, students living on campus generate very little parking demand (less than 1 parking stall per 10 housing beds) and it is anticipated that the Project will result in an overall net reduction in parking demand of 74 spaces. Site preparation will begin summer 2019 with utility upgrades, road works, and selective deconstruction of concrete bridge walkways. Selective deconstruction of Lansdowne concrete bridge walkway will begin summer 2019. Selective deconstruction of Craigdarroch concrete bridge walkway will begin summer 2019. In November 2018, the proposed building designs were presented to neighbouring community associations in Saanich. The presentation can be found here. In June 2018, an overview of the preliminary schematic design was presented to neighbouring community associations in Saanich. The presentation can be found here. In February 2018, a brief overview of the project was presented to each of the neighbouring community associations in Saanich. The presentation can be found here. What will the new housing include? The two new student housing buildings will include 783 beds. 621 of these will be new beds for students currently living off-campus and 162 will replace beds from the current housing buildings. The new student housing will respond to a broad range of student needs, including people with a wide range of physical abilities. The buildings will offer traditional dorm rooms, and new "community-living" style rooms which include single rooms with a shared kitchen and living area. The creation of the 2016 Campus Plan involved extensive community engagement. 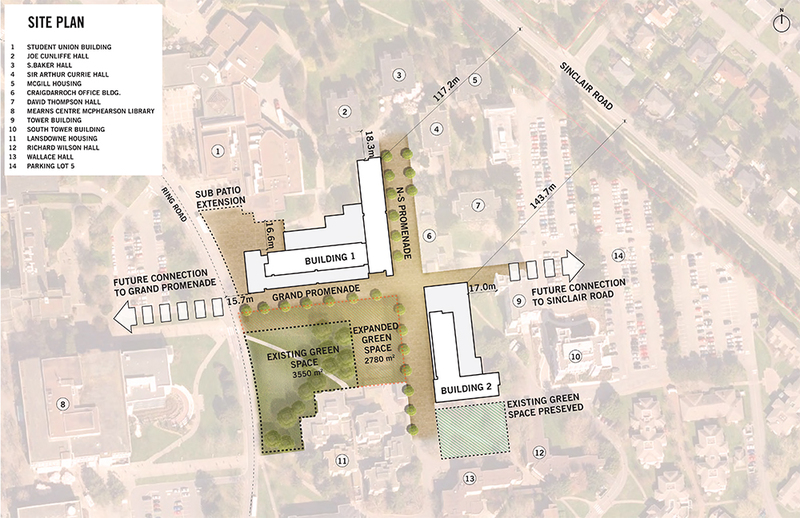 Part of the Campus Plan renewal process involved identifying a number of different sites on campus that might work for a modern building for student housing. The university has selected two sites, “Ring Road” and “Cadboro Commons,” that will accommodate two new buildings for student housing on campus. These sites were supported by Campus Planning Committee and the President in November 2017. 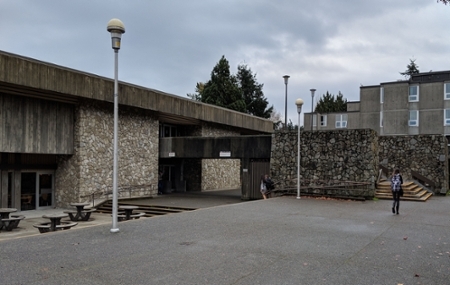 Building 1: Located to the south of the Student Union Building, this site will require the deconstruction of Emily Carr Residence and Margaret Newton Residence. The new building will include a dining hall and servery on the main floor with student housing on the upper floors. This site will be developed first. Building 2: The construction of a new student residence on this site will require the deconstruction of the existing Cadboro Commons building. The new building will include conference, meeting and academic space on the main floor with student housing on the upper floors. The proposed student housing project will provide housing on campus for 621 students currently living in the community. The project will not displace existing parking stalls. Students living on campus generate less parking demand than those students living in the community. As a result, daily commuting trips to and from the campus will decrease and demand for parking on campus is also expected to decrease by 74 parking stalls. There are two car-share programs available on the UVic campus including Modo and ZipCar. U-Pass provides students with unlimited access to Victoria region public transit and the new student housing project is located within 200 m of the UVic Transit Exchange. UVic also offers the UVic Employee bus pass program that offers more than 50% off the regular price. The new student housing project will also integrate 56 secure, indoor bicycle storage (32 in Site 1 and 24 in Site 2), 46 short-term uncovered and 193 long-term covered bike parking stalls, and end-of-trip facilities in each building. The buildings will be designed and constructed to meet both LEED and Passive House standards, a first for the campus. Passive House can reduce energy consumption by up to 80% by using techniques like: triple-glazed windows, solar sharing, a reduced window to wall ratio, and more insulation to reduce heat loss. LEED (Leadership in Energy and Environmental Design) results in more energy and resource-efficient buildings with techniques including: low flow fixtures, drought tolerant plantings, low VOC interior finishes, and energy efficient fixtures and appliances. Build up rather than out and use an efficient building footprint to conserve greenspace. Use passive design principles to reduce energy use and GHG emissions, creating a showcase project for the university. Focus on user comfort, health, physical and mental wellness, personal growth and development. Minimize waste from construction, deconstruction, and operations. Design durable, adaptable, and low maintenance buildings to reduce life cycle costs. Foster sense of community through an inclusive and welcoming design. Display sustainable element and operations to inspire positive behaviours and stewardship. Incorporate Indigenous design elements to create opportunities for learning and promote mutual understanding and respect. As we consider the future, we will preserve the spirit of place inherited from the past, respecting and supporting the commitments to environmental stewardship and sustainability that are so widely shared in our community and our culture. As part of the design and process, the project will explore opportunities to recognize and preserve the spirit of place inherited from the past, and connect students to Indigenous communities and the history of the traditional territories where UVic resides. Building on UVic’s Indigenous Plan, the project design process will explore opportunities to include design elements that can educate the campus community about Indigenous history and culture. We acknowledge and respect the Lkwungen-speaking peoples on whose traditional territory the university stands and the Songhees, Esquimalt and WSÁNEĆ peoples whose historical relationships with the land continue to this day. Over 1,200 campus and community members have engaged on planning principles and early design concepts. In November 2018, the campus and neighbouring communities were engaged on the proposed designs for final feedback before applications were submitted to the District of Saanich for approval. A copy of the engagement summary can be found here. In June 2018, the community was engaged on early design concepts for each of the buildings. The community was also engaged on sustainable design principles. A copy of the engagement summary can be found here. The broader community was engaged in March of 2018 to provide feedback on the planning principles for each of the sites including; building massing and height, pedestrian promenades, vehicle/delivery access and transportation and parking. A copy of the engagement summary can be found here. UVic Students were engaged in the fall of 2017 and provided early feedback on room furnishings, interior common rooms, outdoor landscape design and meal plan options. A copy of the engagement summary can be found here. The architectural team leading the new student residence project is Perkins + Will. Perkins + Will brings leadership and expertise in the design and planning of student life facilities, having worked with nearly 300 colleges and universities across the country and internationally over the past 30 years. They’ve assembled a team of local and international professionals who are leaders in their fields of engineering, food services planning, public engagement and sustainability. To learn more about our existing residence community click here. To learn more about our Campus Plan, click here. To learn more about our Sustainability Action Plan, click here.